Pest monitoring Monitor fields for flea beetles soon after transplanting or as seedlings emerge. Flea beetles attacking the cotyledons of emerging broccoli seedlings can destroy a new planting in 24 hours. 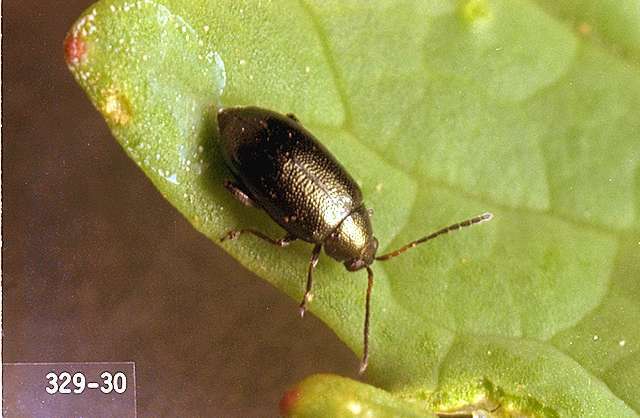 Treat for flea beetles when small holes show on transplants or on plants from seeded fields. Young plants (three to five leaves) often withstand flea beetle injury, but they may be killed if the weather is dry and windy. The percentage of plants affected and forecasted weather conditions will indicate the need to treat. alpha-cypermethrin (Fastac EC) at 0.012 to 0.025 lb ai/a. PHI 1 day. REI 12 hr. Retreatment interval 4 days. Do not exceed 0.075 lb ai/a per season. carbaryl (Sevin 4F) at 0.5 to 1 lb ai/a. PHI 7 days. REI 12 hr. Retreatment interval 7 days. Do not exceed 6 lb ai/a per season. cyantraniliprole (Exirel) at 0.088 to 0.133 lb ai/a PHI 1 day. REI 12 hr. Retreatment interval 5 days. Do not exceed 0.4 lb ai/a per year. deltamethrin (Delta Gold) at 0.018 to 0.028 lb ai/a. PHI 3 days. REI 12 hr. Do not exceed 0.14 lb ai/a per season. Retreatment interval 3 days. spinetoram (Radiant SC) at 0.047 to 0.063 lb ai/a. PHI 3 days. REI 4 hr. Retreatment interval 4 days. Limit 4 applications per year. Do not exceed 0.219 lb ai/a per season. Follow resistance management procedures on the label. Suppression only. spinosad (Success, Entrust SC) at 0.047 to 0.094 lb ai/a. PHI 3 days. REI 4 hr. Do not exceed 0.33 lb ai/a per season. Retreatment interval 5 days. Entrust SC is OMRI-listed for organic use. zeta-cypermethrin (Mustang) at 0.022 to 0.05 lb ai/a. PHI 1 day. REI 12 hr. Do not exceed 0.3 lb ai/a per year.